Always attention to detail, technical skills, passion in our work and great attention to customer needs are the strengths that have allowed us to excel in the field of sale of "HOW TO PINSTRIPE" A. Johnson. Consultando il catalogo di Aerografando you will immediately notice how vast it is and how diversified the model range is Books, magazines and DVD's, you will find the best "HOW TO PINSTRIPE" A. Johnson offers at the best prices on all "HOW TO PINSTRIPE" A. Johnson of the brands . In How to Pinstripe, acclaimed veteran striper Alan Johnson teaches you everything you need to know to get started, understand how a good design comes together, and further your mastery of the form. 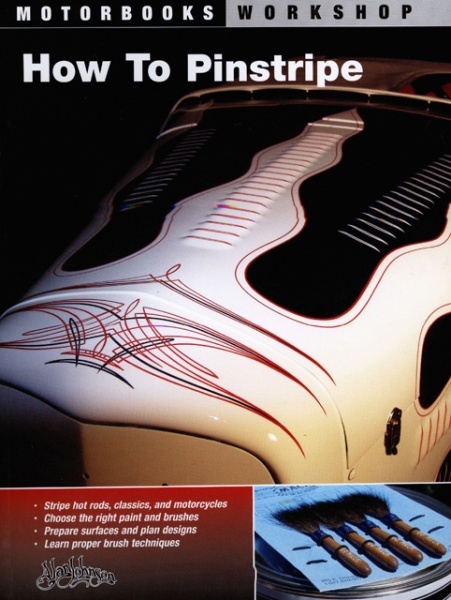 In addition to a primer on the history and evolution of pinstriping, Johnson explains every step of the pinstriping process, fron choosing paint and brushes that suit your style and abilities, to preparing surfaces, experimenting with symmetrical and asymmetrical designs, striping freehand and using patterns. The manual explains the basics of color theory and unique consideration for antique and classic cars, hot rods and customs, and motorcycles. For more advanced pinstripers, there's even tried-and-true advice on apprenticing and working car shows. Book dimensions: 21 x 27 cm. Read the reviews of our customers on "HOW TO PINSTRIPE" A. Johnson of the category Books, magazines and DVD's. Review "HOW TO PINSTRIPE" A. Johnson of the brand . Trust in the quality and professionalism of Aerografando on the sale of "HOW TO PINSTRIPE" A. Johnson, only from us you will find the best prices. You want to have more details on "HOW TO PINSTRIPE" A. Johnson BOOK-HTP or more generally on ours Books, magazines and DVD's? You are looking for a Books, magazines and DVD's but do not you find it in the catalog? Staff of Aerografando will answer all your requests.